Back in May I volunteered with wild dolphins for two weeks in Western Australia. It was incredible. I read about the opportunity in Lonely Planet, as did many of the other people I ended up volunteering with. 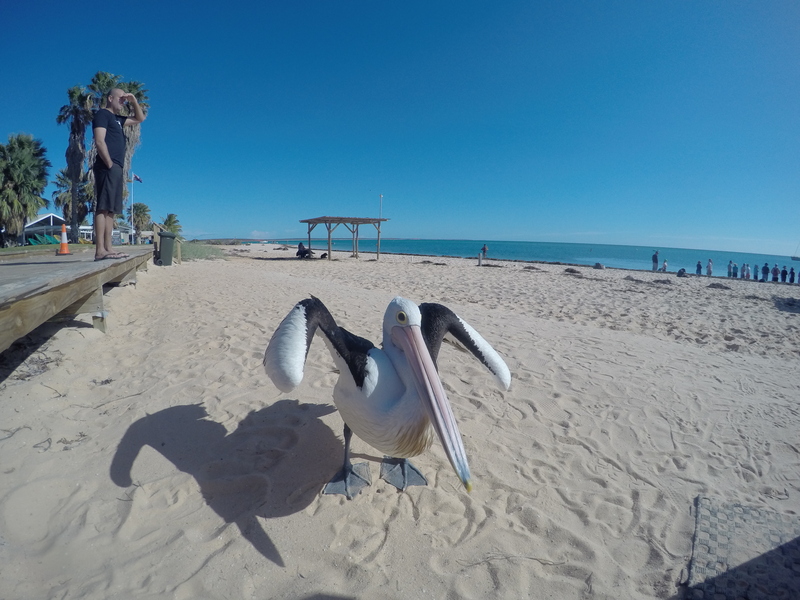 I had decided before coming to Oz that I wanted to volunteer there, and I built my trip up the West Coast around stopping in Shark Bay to do this gig. Essentially what the other volunteers and I did was prepare the dolphin buckets for the feeds. There’s a group of wild Indo Pacific Bottlenose dolphins who frequent the beach at Monkey Mia and come in shore multiple times per day. There were only five dolphins (Nicky, Puck, Surprise, Piccolo and Shock) that were chosen to feed, so I weighed fish and prepared their buckets before heading down to the beach where the park rangers were giving a talk to the crowd. I got to stand in the water with the dolphins, and while I wasn’t allowed to touch them, they would often rub up against my legs, excited for the fish. I then choose people out of the crowd to come into the water to give the fish to the dolphin. We fed them a maximum of three times between 8 am and noon, and gave them only 10% of their daily food intake. This way they were forced to go out and hunt on their own, teaching their little ones how to fend for themselves in the wild. We only fed five of them, all females who had successfully reared calves because the rangers knew that the fish feeding wouldn’t affect their mothering behavior. And how could I forget about the pelicans? We had to prepare a separate distraction bucket for the pelicans that would poach the shoreline waiting for the dolphin feeds to happen. One of us would walk out with a yellow bucket first and the pelicans would run up the beach towards us so that the dolphin experience could happen without incident. The pelicans were quite smart in fact, they even recognized us in our blue volunteer shirts and would sometimes snap at us walking down the boardwalk. Back in the 60s a group of wild dolphins who hunted in the shallows of Monkey Mia started being fed by local fishermen and they continued to come back everyday to receive handouts. The Department of Parks and Wildlife decided to step in because a lot of dolphins calves were malnourished and not taught how to hunt on their own since their mothers spent their time begging for food from fishermen. It wasn’t all glamorous though. There was a lot of waiting around since it was completely up to the dolphins what time they would come into the shore. Some days they would only come in once instead of three. In our downtime we were responsible for cleaning the office and shop and surrounding area. We made up a dolphin song and dance to try and coax the dolphins to come in. And it actually worked on a couple different occasions! If you’re just traveling through, you really only need a day or two in Monkey Mia. No one actually lives there since it is that small, except the resort staff. The park rangers live in the closest town Denham, which is still tiny. There is the resort and the beach and that’s about it. But I’m not complaining. I really enjoyed my time there and I fell into a little routine. Since there’s no other accommodation since the resort, I stayed there and I was able to work for my accommodation by doing 1.5 hours of cleaning on most days. I’d spend my morning volunteering, the early afternoon working for accommodation then would usually go lay on the beach. A couple of times I went for a sail on a catamaran, I went for a kayak, I went 4 wheel driving, snorkelling, ray spotting (although I was never successful). The last couple days were the best, because there were only 3 or 4 of us most of the time and the dolphins were coming in three time, so we were each getting to go in with the dolphins at least twice, sometimes all three times. I really enjoyed my time there and I would absolutely go back. To anyone thinking of do it, I highly recommend it.